At age 33, Boris is very likely the oldest male polar bear on the planet. 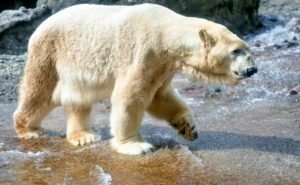 We know he’s the oldest male of his species in zoo-related databases that keep track of polar bears worldwide. And since polar bears live longer under human care than they do in the wild, we think he is the champ. That’s a wonderful distinction for an animal who was born in 1985, spent time in East German circuses, was ultimately rescued from a miserable life of mistreatment by a Mexican circus in 2002, and became a community fixture and guest favorite after he arrived at Point Defiance Zoo & Aquarium 16 years ago. Boris the polar bear explores his Arctic Tundra habitat (2017). He has far surpassed the median life expectancy for male polar bears of about 21 years. And just as elderly humans slow down and battle age-related diseases in their later years, so, too, has Boris. The beautiful bear with the distinctly curved nose who loved to swim playfully in his saltwater pool and occasionally spar with roommate Blizzard, has arthritis in several joints, including his wrists and ankles; several fused vertebrae in his neck; skin issues; and periodic gastrointestinal problems. But like geriatric humans, Boris sees his doctors frequently. Or, rather, they see him frequently. When you’re an 870-pound polar bear, you usually get house calls! During a medical procedure earlier this month, veterinarians treated him for some skin problems, trimmed his nails, took X-rays and adjusted medications. The keepers who care for him daily closely monitor his health and provide him with food enrichments and inducements to get a bit of exercise. Last year, veterinarians provided Boris with groundbreaking stem-cell therapy in the hope it would lessen his arthritic symptoms. The treatment appears to have slowed progression of the disease but did not result in dramatic improvements. He has slowed down considerably in recent months. Boris can choose where he wants to spend time in his habitat spaces and, lately, he’s been opting to stay behind-the-scenes snoozing in his den or in the sun. He occasionally swims in a saltwater pool out of guests’ view. For the most part, he has been choosing not to navigate the Arctic Tundra terrain in the public-viewing portion of his habitat. So if you come to the zoo and don’t see him, he’s probably taking a well-earned nap. If bears could talk…Boris would have a great story to tell. But since he cannot, we tell it for him. Born at a zoo in Germany on Dec. 15, 1985, Boris eventually wound up with a circus in East Germany and later with a Mexican traveling circus. He is the last remaining bear in a group of six that were rescued from that circus in November 2002. The bears, malnourished and suffering from chronic skin conditions, were seized by the U.S. Fish & Wildlife Service when the circus made a stop in the U.S. territory of Puerto Rico. Point Defiance Zoo & Aquarium was among a handful of zoos that volunteered to provide homes for Boris and his circus friends. That’s exactly what the Zoo staff did. Boris and circus mate Kenneth arrived at Point Defiance Zoo & Aquarium in need of hearty chow and suffering from a skin fungus likely caused by the heat and humidity of southern latitudes. They thrived under the expert care of our keepers and veterinarians, swimming in the huge saltwater pool and delighting visitors. Kenneth lived at the zoo until his death at age 27 in 2012. And, Boris? Unlike geriatric humans, he can’t spend his days in a rocking chair on the house porch. But he can – and does – think snoozing on a behind-the-scenes sun porch is a fine activity for an old bear. FIND OUT MORE: Meet both of our polar bears here.